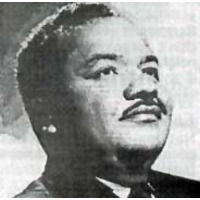 Álvaro Carrillo Alarcón was a Mexican popular music composer born in San Juan Cacahuatepec, Oaxaca, on 2 December 1921, who died in a car accident on 3 April 1969. He wrote over 300 songs, including Amor mío, Sabor a mí, Como se lleva un lunar, El andariego, Luz de luna, Sabrá Dios, Seguiré mi viaje and La mentira. In 1940, he joined the National Agricultural School in Chapingo and composed his first songs as a student. In 1945, he graduated in Agricultural Engineering. He worked in the Corn Commission, but left engineering to become a composer. He became a friend of Antonio Pérez Mesa of the Trío Los Duendes and gave him the song Amor which quickly became popular. Yoshiro Hiroishi, a famous Japanese singer recorded his Sabor a mí, which became a worldwide hit. The many other interpreters of his songs include Javier Solis, Pepe Jara, El Trio Los Santos and Linda Arce. Álvaro Carrillo's life inspired the film Sabor a mí, played by José José and directed by René Cardona.